One of the most talked about subjects before a race is the conditions, what are they going to do? What does the forecast say? How strong is the wind going to be on race day? If you travel for a race or line up in a race be ready for anything, at home I train in all conditions. You can’t have a weakness whether being mental or physical if you want to race the best competitors from around the world. The morning of the race was shrouded in low fog, with no breeze to blow it away and the sun taking its time to help burn it off. All craft were loaded onto trucks for the journey up to Clearwater Bay, our start for the 2011 Dragon Run. Team Nelo, were ushered away to their waiting limo while everyone else was herded onto buses for the ride to Clearwater Bay. The race start was held up for an hour to gain more favorable conditions and the race organizers were rewarded, as the wind continually grew stronger with each passing minute. Final briefings were said and competitors hit the water for their warm up and their 22km journey down the coast to Stanley and the finish line. 10 minutes to start warning. 5 minutes to start warning. Competitors were crowding the start line but others lagged behind and before 5 minutes were up, the flag had dropped and the horn had sounded. Andre Santos, team Nelo, had a flying start, quickly putting distance between himself and every other paddler. His reign of terror was short lived as the lead group of more than 20 paddlers swallowed him up. The wind and surf made for great race conditions as we headed out to the Nine Pins, a group of islands 6km off the coast where we would turn and head south for Stanley. Tom Schilverport set the early pace gaining 40 meters on the chasing pack which included myself, Dawid, Hank, Shannon, Jeremy, Cory and others. We had runs all the way out pushing us straight to the Nine Pins. Tom rounded first followed by myself, Dawid and Hank. Sorry I can’t add more names but I don’t look around during the race, peripheral vision only. It was a ninety-degree turn around the Island to set our course for the finish, so that meant; crosswind for the downwind leg. But it didn’t. The prevailing swell was a cross tail from the left and the wind was a cross tail from our right so the runs lined up beautifully to form nice V’s and allow for great surfing across the backs of them all the way down to our headland mark of the ‘Kissing Whales’ outside Stanley Bay. Dawid and Tom took an outside line while Hank took a line tighter in than me. Dawid was the only other competitor I saw, pushing hard on the outside line. I stayed inside knowing that the swell and wind would be more in my favor as we neared the ‘Kissing Whales’. I hit them straight on while Dawid had to work against the runs for longer to get to the mark from his line. There was a straight line across us both and it would come down to who hit the headland first as it is a 5km paddle into the bay with a strong cross head wind due to the prevailing wind direction. 4km before the bay Dawid put in a solid effort, coming more onto my line, while I worked further in again aiming for the straightest line to the headland with the swell behind me. Still neck and neck between the two of us. I know that Dawid leaves nothing out there on the course and I would have to do the same if I wanted a chance at the win. 2km before the bay I made my move, working that little bit harder to chase and pull over the top of every run that I could, if I missed one I knew that he wouldn’t. Most of these races come down to not who caught the most runs but who missed the least; it is the ones that you miss that make the difference. I wanted to make the difference by getting more and not missing any. Last 6km of the race, “concentrate and don’t make mistakes is what I kept telling myself”. My equipment was never going to fail. Nelo XXL ski and a Braca paddle. Races are won and lost due to human error from being tired; I didn’t want to have it happen to me. From my push I hit the entrance to the bay first with about 50m over Dawid and look out here comes the headwind. 5km of it get to the finish line. So much time for so much to go through your mind. Do I have enough left to hold on? Is the person behind me more tired than me? Is someone going to come over the top of both of us? I tried not to look around too many times but it was necessary to give mysef a confidence boost as I was getting tireder. Keep working hard! My lead was slowly growing as the finish line got closer. No one wants a sprint finish after hard racing and I made sure that every stroke that I did was as efficient as I could make it for how tired I was feeling. 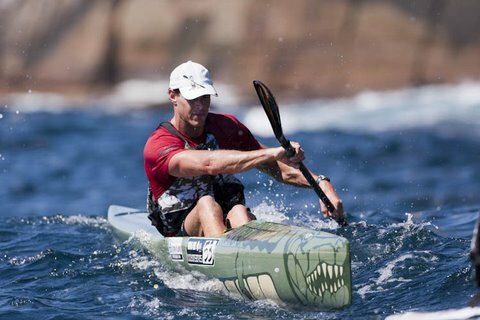 22.5km and an hour and a half after the start I crossed the finish line first with Dawid second and Hank in a fast finishing third with Kellogg’s Ironman Cory Hill having a great paddle to finish fourth. Well done to all that competed and fantastic work to all the organizers, volunteers and supporters who again put on one of the best races of the year. Big congratulations to Clarence ‘Team Nelo’ who took out the shorter 10km Chicken Run.